Under a progressive tax system wealthier people pay a larger share of their income than poorer people - in a regressive tax system the reverse is true. In a progressive tax system richer people pay a larger proportion of their wealth to the taxman than a poorer person. An income tax with a higher rate band for bigger earners – like Britain with a 40% top rate - is progressive. If everyone paid exactly the same percentage of their income in tax the system would be proportionate. With a regressive tax the poorest people pay a larger percentage of their income in tax than a richer person. 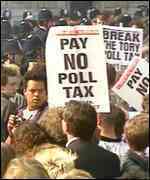 Margaret Thatcher’s poll tax – or community charge – was a regressive tax. A poll tax of £300 would cost someone earning £10,000 3% of their income but it would only cost a person with a salary of £30,000 1% of their earnings. Other regressive taxes include Ken Livingstone’s congestion charge and VAT. VAT is an indirect tax levied on expenditure. Expenditure taxes – unless imposed on luxury goods – are nearly always regressive. The British tax system employs a mix of regressive and progressive taxes. Progressive taxes – because they afford redistribution - are thought to be more socially just but very steep progressive taxes can become counterproductive. In 1970s Britain the top rate of tax on income hit 83% and 98% on savings. These counterproductive levels of progressive taxation ‘soaked’ the rich so much that they started to work abroad (causing the ‘brain drain’), hired accountants to hide their earnings or simply stopped working and innovating. Excessive levels of progressive taxation cut the tax take and provide an illustration of one of Boetcker’s ‘Ten Cannots’. The Laffer Curve – made famous by Ronald Reagan – attempted to show that cuts in counterproductive levels of taxation can increase the revenues collected by government. Arthur Laffer was vindicated in the early 1980s by the governments of President Reagan and Margaret Thatcher. Their tax cuts made it advantageous again for businesses to invest, households to save and entrepreneurs to innovate. During this time, what economists call the substitution effect (which means extra work becomes more attractive than extra leisure) overwhelmed the income effect (which refers to how people reduce their work effort because they can attain their desired standard of living by working fewer hours). What kind of savings account?If this is a regular account at the bank, you pay tax on the interest income each year but nothing when you take the money out.If it’s a brokerage account invested in mutual funds, then there can be capital gains when the mutual funds are sold (and you have to sell them to get the money out). The tax is only on the GAIN, not the entire amount. Commonly called UGMA and UTMA accounts.If this is a tax deferred savings account (529 plan or coverdell ESA), then you don’t pay taxes each year, but then look at what the money is spent on when it’s withdrawn. If it’s used for qualified educational expenses, it’s tax exempt. If not, tax + 10% penalty. I have recently started a site, the information you provide on this web site has helped me tremendously. Thanks for all of your time & work. "Men must be taught as if you taught them not, And things unknown proposed as things forgot." by Alexander Pope. I got what you mean , appreciate it for posting .Woh I am thankful to find this website through google. "Food is the most primitive form of comfort." by Sheila Graham.